The step index fiber is a cylindrical waveguide core with inner core has a uniform refractive index of n1 and the core is surrounded by an outer cladding with a uniform refractive index of n2. In this fiber, the cladding refractive index ( n2 ) is less than the core refractive index ( n1 ) but there is some abrupt change in the refractive index at the core-cladding interface for using simple step-index fiber. The propagation of light wave within the core of step index fiber takes the path of a meridional ray. Ray follows a Zig Zag path of straight line segment. Single mode step index fiber has a central core that is sufficiently so small so that there is essentially only one path for light ray through the cable. The light ray propagates in the fiber through reflections. Typical core size is 2 to 15 micrometer. so single mode fiber is also known as the fundamental or monomode fiber. Single mode fiber will permit only one mode to propagate and also does not suffer from mode delay difference. These are primarily developed for the 1300 nm window but they can be also be used effectively with time multiplex and wavelength division multiplex system operating in 1550 nm wavelength region. The core fiber of a single mode fiber is very narrow compared to the wavelength of light is to be used. Therefore, only one single path exists through the cable core through which light can travel. Multimode step-index fiber is the most widely used in optical fiber communication. It is easy to manufacture and also its core diameter is 50 to 1000 micrometer. In this mode, the light ray is propagated using the principle of total internal reflection. Since the core index of refraction is too much higher than the cladding index of refraction, so the light enters at less than the critical angle is guided along the fiber. Light rays passing through the fiber are continuously reflected off the glass cladding towards the center of the core at different angles and also have lengths, limiting overall bandwidth. 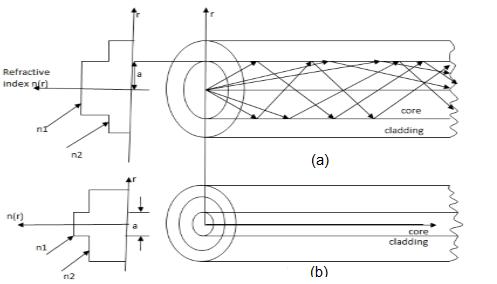 One of the disadvantages of multimode step-index fibers is that the different optical length caused by various angles at which light is propagated relative to the core devices, causes the transmission bandwidth to be fairly small. So multimode step index fiber is typically only used in an application requiring of less than 1 km. The data rate is very slow. The ray path of light propagation is looked like Zig Zag manner. Step index fiber of two types of mono-mode fiber and multimode fiber whereas using step index coupling efficiency with fiber is too high. In step index fiber the diameter of the core is about 50 - 200 micrometer while in the case of multimode fiber and 10 micrometers in the case of single mode fiber type. The refractive index of the core is high. It is mostly used in local network communication.